Once you understand the language of dogs and what your puppy “says” with barks, wagging tail talk, and other body language, you’ll know how to talk to a dog with effective puppy communication. Remember that your puppy is not a mind reader and what’s “normal” behavior for people may be a totally foreign language and offensive to dogs. Instead, you can use “dog talk” to get your message across. Humans are primates that touch and hug, gesture with hands, and have a lound and higher-pitched tone of voice when upset. All of these things can be confusing or even threatening to puppies especially, but also to adult dogs. 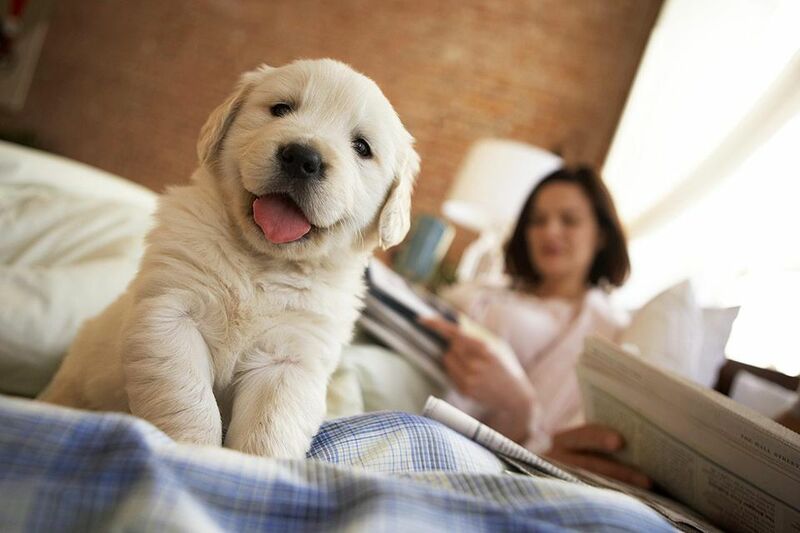 Leaning over your puppy: Humans are taller than pups, and it’s natural to lean down to talk or pet them. But “looming” over top of a dog is intimidating because, in dog talk, this means “I’m the boss, I’m in control.” That can be upsetting or even frightening to pups that already accept your status as the boss. They may use appeasement gestures such as submissive wetting to show they’re no threat. Strange dogs that don’t know you may become aggressive or defensive when you lean over them. They simply fight back what they think of as a challenge. Instead of leaning over the top of the puppy, give the dog space to approach you. Turn sideways and crouch or kneel on the floor so your height and stance don't seem a challenge. Staring with hard eye contact: Direct eye contact also can be intimidating. Use the pup’s own calming signals to tell it you mean no harm. Turn your head away, avert your eyes, and move slowly to give the pup time to build up the courage to stand its ground or even approach. Hugging: For puppies and dogs, hugs are not a sign of affection. Our pets use clasping to grab and wrestle during play or fights, during mating behavior, or simply to show dominance. Forego the hugging and teach your children alternate ways to show affection to dogs. Otherwise, the puppy may lash out in retaliation of what it perceives to be an attack. Kissing: Yes, the new puppy seems to lick-lick-lick you all the time, sort of like a kissing maniac. You may think of kissing as exclusively an expression of love and affection. But even among people, a kiss also can signify respect rather than adoration. Dogs and puppies show their love in other ways. Licking is instead used to show deference, respect, and a declaration that, “I am no threat.” Subordinate dogs lick a more dominant dog—or person’s—face or side of the mouth as an appeasement gesture. If you or your child try to mimic this doggy signal and “kiss” the dog on or near the mouth or eyes, in dog language this tells him that you’re submissive to him. That could get you both into trouble. A large majority of dog bites target kid faces because the child hugged or tried to kiss the dog. Now that you understand what your own body language means, use it to talk dog to your puppy. When you want your juvenile delinquent pup to straighten up and mind, or you want to encourage the shy pup to be more confident, just communicate with him like a canine. And nope, you don't have to wag your tail. Use a calm, low-pitched tone of voice and short clipped words. High-pitched upset voices can sound whiny and send the wrong signals that you are not in charge. Use the same words for the same thing each time so your pup learns your language with repetition. It won't know that "wait" and "stay here" and "I'll be right back" or "don't move" mean the same thing to you. Choose one. Puppies thrive on routine. A clicker training technique works particularly well to communicate what these words mean. Stand tall. Dogs in charge don’t have to make a production out of it, they simply carry themselves like the boss. Everyone believes them so they don't have to prove it. Dogs don’t use hands to control other’s movements—they use body blocks, shove and lean, and control space. Think of the way a shepherd dog herds livestock and prompts sheep to move without ever touching. You can do the same thing, by using your body to control puppy movements. If he’s leaping at you, simply tuck your hands close to your body and lean toward him before he leaps. You invade and control the space first and he’ll back off. For shy pups, think of ways to relieve the angst the same way dogs do. A higher pitched, slow and soothing voice can tell the baby you’re no threat. Don’t loom and lean over the top of the dog. Crouch or kneel. Let the pup approach you rather than chasing after it. If you really want to pique puppy curiosity and show you're no threat, lie motionless on the ground. If you must approach, curve in at an oblique angle instead of walking or running toward the puppy directly. Lick your lips or yawn, while looking away. Try a dog laugh. Sneeze and see if the pup sneezes back. Or mimic the unvoiced breathy “ha-ha-ha-ha” dog laugh sound that dogs use exclusively in play to say you mean no harm. How Do Puppies Communicate With People?